Allow me to interject some personal opinion in here. 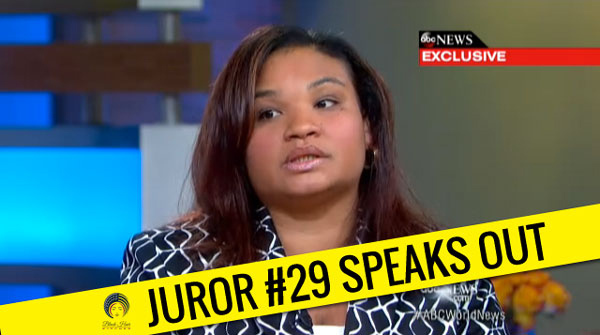 I have not an ounce of sympathy for juror B29 and the loss of sleep she is claiming on her interview with ABC News’ Robin Roberts. What law was she reading that she could not convict George Zimmerman of manslaughter? Was it not “the killing of a human being by the act, procurement, or culpable negligence of another, without lawful justification“? I don’t know that I would have the strength and collectiveness of Sybrina Fulton and Tracy Martin as the jurors who allowed the murderer of their son to go free, step up and out for their 15 minutes of fame. Almost doesn’t count. No matter the story that Maddy, formerly known as juror B29 (I’m sure by 9am Reddit will have the full scope of her personal information), attempts to sow throughout press junkets, her tale of “I was going to be the hung juror” “I fought till the end” does not matter, does not count and is nothing more than an insult to the Martin family. Maybe further into Maddy making TV appearances, we can hear how she explains to her own child what they’re rights are as she allows them to walk down the block, maybe to grab some candy or visit a friend and pray they return home alive and well. Maddy, the only minority on the jury, speaks on not being able to find George Zimmerman guilty of 2nd degree murder,”if you have no proof that he killed him intentionally, you can’t find…you can’t say he’s guilty.” The clip provided by ABC News does not make mention of the added manslaughter charge. This new information challenges our nation once again to do everything we can to make sure that this never happens to another child. That’s why Tracy and I have launched The Trayvon Martin Foundation to try and take something very painful and negative and turn it into something positive as a legacy to our son. If you missed the interview, it will re-air during Good Morning America on July 26th.